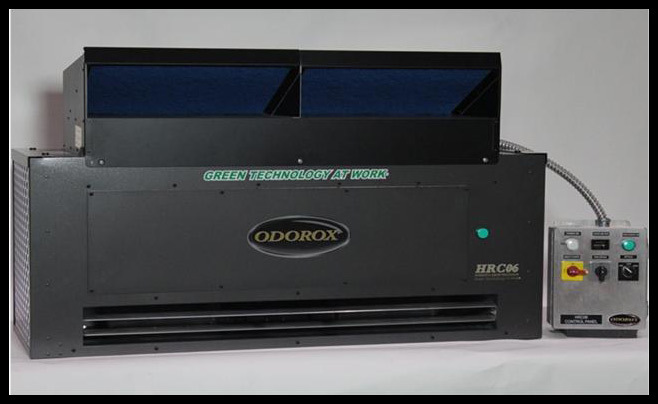 The HRC06™ (Hydroxyl Room Curtain) unit is used to eliminate odors, bacteria, virus, VOCs, off gassing and mold contamination. It is ideal for commercial, institutional, hazmat, veterinary or hospitality use. It is equipped with switch selectable 3 or 6 ODOROX® Hydroxyl generating optics. The unit is designed for continuous operation to blanket your odor source. The HRC06TM (Hydroxyl Room Curtain) unit is used to eliminate odors, bacteria, virus, VOCs, off gassing and mold contamination. ODOROX®, Hydroxyl Room Curtain™ and HGI Industries Inc. are either registered trademarks or trademarks of HGI Industries Inc. of Boynton Beach, Florida USA. Other trademarks are pending in the U.S. and other countries.